Made in small batches, by hand, with Olive Oil. Wholesome ingredients, prepared in small, hand-crafted batches. That’s it. Our ingredient list is simple, because good granola isn’t that complicated. Learn more about what we put into it, and what you can get out of it. Crafted by hand in founder Sue Feld’s kitchen, Olive & Oat is authentically homemade granola. 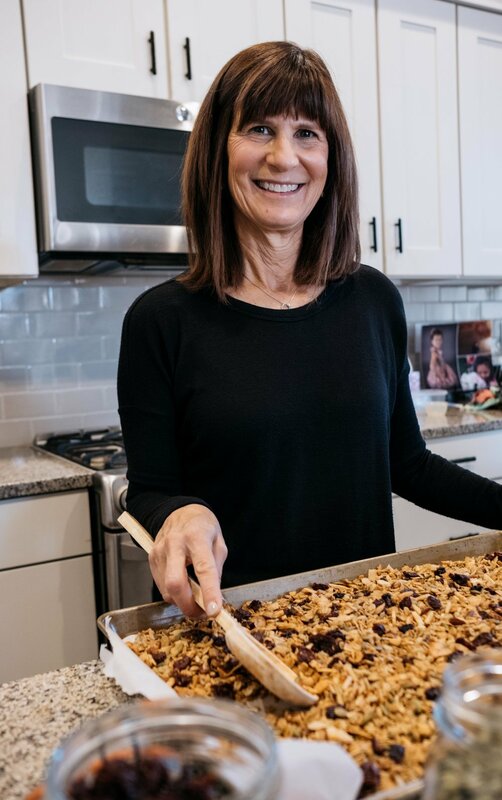 Discover her story and take a peek inside her kitchen—and her process—as she creates the best granola you've ever tried. Good, wholesome ingredients for the people we love. That’s how we started, and we’re not planning on stopping anytime soon. Buy a bag (or 3!) online and we'll ship it anywhere in the US, with free delivery in the Denver area. We can't wait to hear what you think of it. Classic Granola • 11 oz. A mix of oats, pumpkin seeds, sunflower seeds, almonds, pecans, cashews, coconut, brown sugar, pure maple syrup, dried sour cherries and a dash of salt, our granola is tossed in extra virgin olive oil and oven-baked until crunchy and golden brown.